A grisly killing in Munich left a 31 year-old woman dead. Katrin M. (last name withheld) was stabbed 18 times with a katana, and now some members of the German press are pointing the finger at Final Fantasy. German press, like Munich tabloid TZ, is running photos of the alleged killer, 18 (or 19, depending on the report) year-old Marco F., "cosplaying as his favorite Final Fantasy character." The character, however, isn't even from Final Fantasy. 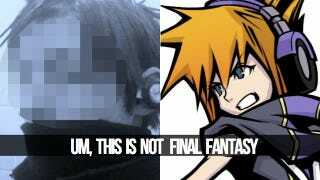 Instead, it looks to be Neku Sakuraba from music-heavy action RPG game The World Ends with You. While that title has combat, one could hardly call the cartoony TWEWY a "violent video game." Another paper, Abendzeitung, ran what is apparently Marco's Final Fantasy XIV profile. The link is tenuous—even more so because Marco was not a regular FFXIV player. Yes, there's violence in FFXIV—sword violence, even—yet, the violence is not bloody or graphic. It's sanitized. This coverage proves that, once again, targeting video games is easier than discussing mental illness.